Located in the Mojave Desert, Las Vegas is filled with entertainment and some of the most luxurious hotels in the world with some of the finest transportation services from stretched limousines to executive sedans. Some of the best nightlife in downtown Las Vegas can be found on the Strip and Fremont Street where visitors can find casinos and restaurants throughout the four mile stretch. Here is a list of some of the most popular hotels and resorts in Las Vegas. The city is not only an international tourist spot but a business hub as well, hosting both travelers and people from the business community. Therefore, airport services are well maintained and efforts are made to increase their quality level, every passing day. The airport staff manages a tight security by deploying the state of the art techniques. After proper security check, you have the access to almost all the terminals making it easy for you get on your flight. It is centrally located in the beautiful city of Vegas allowing you an easy outreach to every spot in the city. You can easily find a taxi service from within the parameters of the airport. The local transport terminal is in close proximity to the airport as well, allowing you to get on a cheap commute if you don’t want to spend too much on the taxi. Las Vegas is one of the most happening cities in the US. Famous for its countless entertainment options, crazy nightlife, and captivating views, it attracts scores of visitors both from the inside of the US as well as from the outside. The main source of commute to this place is LAS Airport, also known as McCarran International Airport, hosting flights from all around the globe. Though it is a busy airport, but you don’t have to wait for a long time in the lines. The service here is quick and the staff is very well trained. McCarran International Airport is the main hub for airplanes to land in Las Vegas – as soon as you step off board, you’ll see excitement from the beginning. With slots lining every inch of the airport, from baggage claim to the exit, you’ll be tempted with excitement almost immediately. Reserve a shared ride van with us, getting a ride to the famous Las Vegas strip, where you’ll have instant access to tons of hotels, casinos, and shows. Take a group trip to Stratosphere Las Vegas, a 1,150-foot observation tower that not only allows guests to gamble and eat dinner inside, but also admire the Las Vegas strip from an extraordinary height while riding on the rooftop roller coaster. Get everyone there in one piece by booking a private van, and be sure to hold onto your hats when you get to the top. There are many unique ways to explore the town, but one of the best is through the perspective of a private sedan, especially when that sedan is rented through area companies. Las Vegas is filled with tons of romantic getaways, the MGM Grand being no exception. With real-life lions in the lobby, a chic luxury restaurant, and the utterly iconic location, you won’t have any reason to leave the building. That doesn’t mean, however, that there’s nothing to see – be sure to take your car out to other local landmarks like the beautiful trails at Red Rock Canyon National Conservatory. Just because Las Vegas is filled with sultry and scandal doesn’t mean that’s all you have to do. If you and your group are looking for more of a family-friendly adventure, be sure to book a private SUV and head out to Shark Reef at Mandalay Bay, an amazing aquarium that holds exotic reptiles and strange marine life. Get your vehicle by contacting our local service providers, which offer great SUVs. Get the best of both worlds by visiting the Adventuredome, a massive dome-covered amusement park perfect for kids, and with plenty of casinos on the outskirts, which is perfect for parents. There is so much luxury bursting at the seams in Las Vegas that it’s almost impossible to pick out the best restaurant or hotel. Whether you want to eat at the amazing Italian restaurant, Sinatra or have VIP cocktails at famous Pan-Asian glam spot, TAO Las Vegas, you can show up in class by rolling up in a stretched limousine. Get your luxurious ride today by reserving your own private chauffeur with us. Las Vegas casinos are some of the biggest in the world, making it a perfect place for large groups to get lost. Get lost together by reserving a chartered bus and visiting incredible locations like Neon Museum, a visual powerhouse that will send anyone into a trip, and Treasure Island Hotel, a casino that hosts a free show outside of its walls every night. 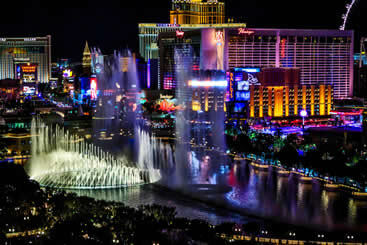 Las Vegas is the place to be for casinos and some of the best luxury hotels and resorts in the world. Explore the many exciting things you can do while Visiting Las Vegas and explore it like you have never done before. With over three thousand rooms, this Polynesian style hotel has its own casino which is among one of the favorites in Paradise, Nevada. The Mirage is world-famous and features luxurious suites, tons of restaurants from quaint delis to five star restaurants, top notch entertainment and much more. You can find discount airport transfers for Las Vegas McCarran International Airport with local providers for private shuttle buses and shared ride van services. Next to Harrah’s Las Vegas Hotel and Casino this hotel is among the most luxurious on the Las Vegas Strip. With its design similar to Venice, Italy the hotel has over 4,000 rooms available for tourists to stay in during their visit. As one of the biggest hotels in the world the MGM Grand in Las Vegas has over 5,000 rooms for its hotel guests to stay in. It is located on the southern end of the Strip nearby the Tropicana.